Barely had they begun the difficult woodland trek when, crossing a stream swollen with the rush of spring rain water, Houghton dropped the horn that contained ink needed to record the survey work. We can only assume Houghton retrieved the vessel quickly before all the contents were lost. Hence, Windham’s very first place name: The Inkhorn Brook. Houghton’s helpers were known as chain men. Their burden into the wild included carrying compasses and lengths of chain, probably 66 feet long. The compasses measured direction; the so-called “Gunter chain” recorded distance. 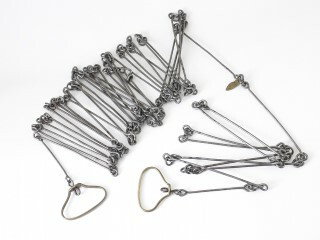 Pictured here, they were made of heavy gauge wire and swivels. Some had so-called tally tags which provided a read-out of distances. Chain men would pull the handles at each end until it was straight and tight. But the process had its limitations; accuracy suffered. Indeed, mistakes were made. Originally, New Marblehead was bounded on the east by North Yarmouth, on the north by New Boston (Gray), on the north and west by Sebago Lake and the Presumpscot River, and on the south by Falmouth (Portland). The town of Falmouth disputed the survey, claiming a portion of its northern tract had been transferred to New Marblehead. The General Court ruled in Falmouth’s favor. Lost to New Marblehead was real estate between Sacarappa Falls and Inkhorn Brook, which unfortunately had received a heavy investment from the New Marblehead Proprietors. In our next installment of The Historical Record, we’ll meet New Marblehead’s first settler, the remarkable Thomas Chute.